01/05/2014 -- Second Sunday of Christmas -- "What in the world is God up to?" 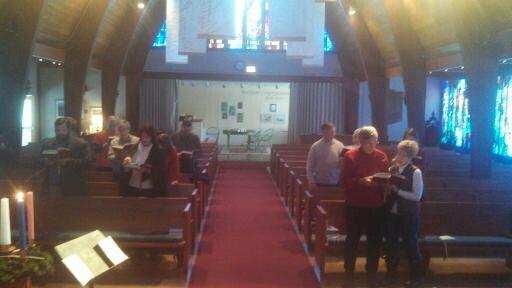 We celebrated a second Sunday of Christmas even though Epiphany begins on January 6th. Epiphany is the season of the church calendar (which does not designate an event, but rather the ongoing revelation of Jesus as the Son of God) which lasts for about 8 weeks and leads up to Ash Wednesday, the beginning of Lent. On the first Sunday of Christmas, we have traditionally done a hymn sing. We did so again on Sunday and had a wonderful time. We also welcomed our new organist, Alan Wingard, who valiantly kept up with hymn requests from the congregation. It was beautiful and inspiring to hear the voices of our congregation joined together in song and praise of the birth of our Lord, Jesus Christ. 12/24/2013 -- Christmas Eve -- "A Light Coming Into the World"
We had a beautiful Christmas Eve service on Tuesday night. We welcomed the light of Jesus Christ into the world with music, song, prayer and Scripture. Every year, we end our service with a Moravian Candle Lighting rite, where the whole church is lit only with candle light. I have included a picture - not a great picture, since I took it from the pulpit in the middle of the ceremony (May the Lord forgive me...). It is one of my favorite parts of the Christmas Eve service, which is one of my favorite services of the year. Thank you to all who helped and all who attended. Your presence made the light all the more present, and in so doing, made Christ all the more present for everyone there. I have included the entire Christmas service below. 12/22/2013 -- Fourth Sunday of Advent -- "Signs of Joy"
This morning we had the privilege of hosting Cellist Nora Willauer as our guest musician. I have posted two audio files - the first is just the sermon; the second is the full service so you can hear Nora's excellent gift to us today. Peace and blessings this Christmas week! Join us on Christmas Eve at 6pm for our full service, and Christmas morning for our pajama service at 9:30am. A Snowstorm remnant of 15 brave souls. This morning, we had a great service with a few die-hards who came out in the snowstorm to worship. Thank you to all who showed up! There were 15 of us while the wind and snow blew outside. 12/08/13 - Second Sunday of Advent - "Peace in an Un-peaceful World"
12/01/2013 - First Sunday of Advent - "Longing for Hope"
Today marks the beginning of a new church year. For the next four Sundays, we live in expectation for the coming of the Messiah, Jesus Christ. Traditionally, each Sunday of Advent represents a different aspect of waiting: Hope, Peace, Love and Joy. This week, we look at Longing and Hope in our relationship with God.